Striker Danny Hylton admitted he isn’t the biggest fan of the new rules that have come in regarding showing dissent to officials this term. The new FA ruling passed ahead of the season, now means that any player who is ‘visibly disrespectful’ towards a referee/referees assistant or challenges a decision ‘aggressively’ will get a booking. It’s a man’s game, it’s competitive, I suppose you are going to get frustrated at times, but you’ve just got to try and channel it the right way. 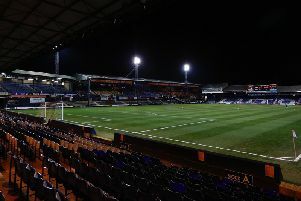 Hylton was on the receiving end of two such cautions during Town’s last home game against Doncaster Rovers, and when asked if the thought the rule change was too severe now, he said: “A little bit, it’s a man’s game, if you can’t show a bit of frustration or lose your temper a little bit, in the right way – I didn’t run up and hit anyone, did I? “I just threw something at the floor. It’s not the best and maybe it’s going a little too far, but those are the rules and you’ve got to deal with them. “It’s a man’s game, it’s competitive, I suppose you are going to get frustrated at times, but you’ve just got to try and channel it the right way. “It’s a bit like a naughty little kid really, you throw your toy on the floor and get in trouble from your dad. Hylton’s second yellow came after he was deemed to have thrown a litter picker in the direction of the linesman, after not winning a free kick when he was barged over the by-line. The striker continued: “I found a litter picker from somewhere and I’ve thrown it at the floor. “The linesman said I threw it at him, I don’t quite know how he came to that conclusion, but he did. It was silly on my part. Although not impressed by the decision to dismiss him, as he missed Tuesday night’s trip to Hartlepool, Hylton knows he has to tone things down at times. He added: “I let myself down last week. I let the team, the gaffer, I let everyone down. The striker returned in style on Saturday, with a fine individual goal against Cheltenham and avoided entering referee Trevor Kettle’s notebook, despite taking a battering from the Robins’ centre halves at times. Although trying to stay out of trouble, Hylton won’t alter his game dramatically, saying: “I’ve done well. I went a whole game without another yellow card. “I know I’m on a fine line, one more booking and I’ll be banned again but it won’t change me, it won’t change anything I do. “I’ll just try to cut out the silly bookings as it’s how I play. “I play on the edge and I’ll keep trying to do that, but just try and cut out the silly bookings. Town boss Nathan Jones was happy to see Hylton not going into the notebook once more, added: “It’s something he needs to avoid as he can’t rack them up for silly little things. “I’m glad for him because he’s had a little bit of a rocket and taken everything in the right way.